Frank W. James, 85, of the Fiskdale section of Sturbridge, died Thursday, Jan. 10 at home surrounded by his family. He was the husband of Hazel M. (Miner) James who died July, 23, 2018 after 65 years of marriage. He leaves his daughter Leslie A. McDaniel and her husband Timothy of Fiskdale with whom he lived, his son Mark S. James and his wife Christine of E.Brookfield, four grandchildren; Meredith Marum and her husband David of Worcester, Byron James and his partner Julie Ells of Worcester, Kelly Ronca and her husband Vito of Quincy and Casey McDaniel and her partner Zachary Barkan of Norfolk, VA., four great grandchildren; Lillianna, Braighlynn, Evie and Connor and several nieces and nephews. Frank was born on February 18, 1933 in Worcester Memorial Hospital the son of Willis F. and Gladys A. (Nadow) James . He lived in Worcester for 27 years, graduating from Worcester North High School in 1952. In 1953, Frank married the love of his life Hazel Miner before entering the Army during the Korean War. 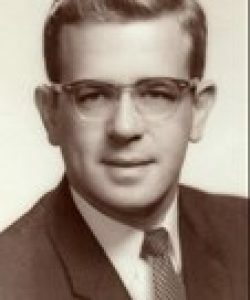 After the war, Frank attended Worcester State Teachers College obtaining a Bachelors of Science in Education class of 1959, he obtained a Masters Degree in Education from Worcester State College in 1965. He began his teaching career in Philmont, NY, at Ockawamick School in 1959. Frank returned to the Worcester area in 1963, moving to Rochdale, MA where he lived for 56 years. During that time he taught high school English, serving in Wachusett Regional High School, and Framingham High School . Frank taught at Framingham High School for 27 years, before retiring in 1995. He also taught continuing education at Boston College, Worcester State University and Fisher Junior College. He was a member of the American Legion Post 0462, the Mass. Teachers Assoc., Framingham Retired Teachers Assoc. He enjoyed playing racket ball, tennis. During summer vacations, you would most likely find Frank camping somewhere warm and sunny with his family. Memorial calling hours will be held on Friday, Jan.18th. from 4 to 6 p.m. in the MORIN FUNERAL HOME, 1131 Main St., Leicester. Burial will be private in Worcester County Memorial Park, Paxton. In lieu of flowers, contributions may be made to a charity of choice .